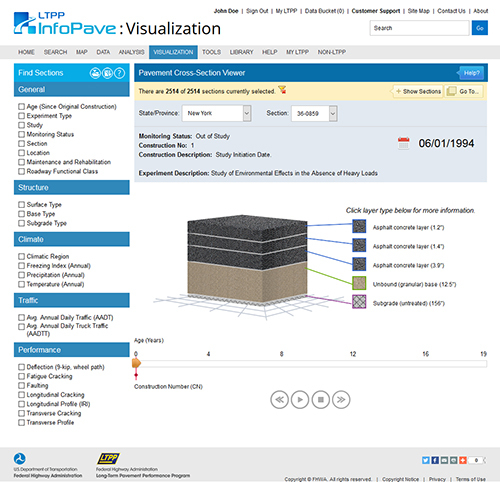 The Long-Term Pavement Performance (LTPP) program's data portal — LTPP InfoPaveTM — facilitates access and analysis of its data through a variety of online data selection and visualization tools. Through a variety of advanced filters, you can narrow your search to the test sections that correspond to your interest. Users can now save the selected filter criteria for future reuse and automatic reapplication instead of selecting and applying each criterion individually. The Data Selector feature provides an organized tree structure to search and select pertinent data tables and fields. Users can now subset the data of their choice by selecting a date range. results, and the actual type of information sought by users. The Map feature presents section locations geographically. The map provides the ability to zoom in and out, pan, and filter section results using userselected criteria. Users can visualize the availability of data on the map, and download data in Keyhole Markup Language (KML) format. The Data Visualization feature provides tools to analyze the data visually. These include the Section Timeline, which provides the event history of each LTPP section; the Pavement Cross-Section Viewer, which offers a graphical representation of pavement structural layers; and the Manual Distress Survey Viewer, which displays the distress maps of each test section. The State/Province Summary Report provides an overview of key structure, climate, traffic, and performance data corresponding to LTPP sections in every State or Province. For a more in depth review of section level data, you can use the Section Summary Report. Both of these reports could either be printed or exported in Microsoft Excel® file format. maps, time series, scatter plots, and bar charts. The Correlation Analysis feature provides a parallel coordinates plot, where the user can select multiple attributes to visualize their data. Modern-Era Retrospective Analysis for Research and Applications (MERRA) climate data from the National Aeronautics and Space Administration (NASA) is available in the form of host column description (HCD) files that can be used as input to AASHTOWare Pavement Mechanistic-Empirical (ME) Design Software. The Help hub includes various features including announcements, how-to videos, sample applications, presentations, and frequently asked questions to assist InfoPave users. In addition, an interactive help tour and text-to-speech feature has been developed for a step-by-step guide to several InfoPave features. Furthermore, sample structured query language (SQL) codes have been provided to help users with the SQL Data Export feature. The Web-centric interface for the LTPP Information Management System (IMS) provides a powerful and flexible tool that enables users of all levels — professionals, researchers, and students — to view, visualize, extract, and employ LTPP data. The LTPP program was initiated in 1987 to satisfy a wide range of pavement information needs. Over the years, the program has accumulated a vast repository of research quality data, extensive documentation, and related tools, which compose LTPP's comprehensive IMS. The LTPP IMS is comprised of two major components, the Pavement Performance Database (PPDB) and the Ancillary Information Management System (AIMS). The PPDB, which aims to find out how and why pavements perform the way they do, contains comprehensive data collected throughout the life of the experimental pavement sections. AIMS is a central electronic repository that contains information such as raw data, images, reference materials, resource documents, and other facts that support and extend the data stored in the PPDB. In addition, the LTPP program maintains a comprehensive reference library with more than 1,200 research reports, tech briefs, and program documents in electronic format that explain how the data are collected, processed, and stored. The LTPP IMS is the premier product of the LTPP program and will be used for research, pavement design, and product development for decades to come. The data and information in the LTPP IMS were made available via the Web through the data portal system, LTPP InfoPave, in January 2014 at the Transportation Research Board (TRB) 93rd Annual Meeting. An enhanced InfoPave is planned to be released in January 2016 at the TRB 95th Annual Meeting. 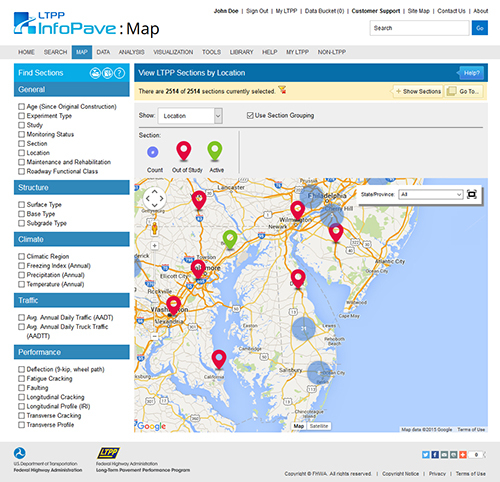 InfoPave is the public gateway to access data and other information about the LTPP program. 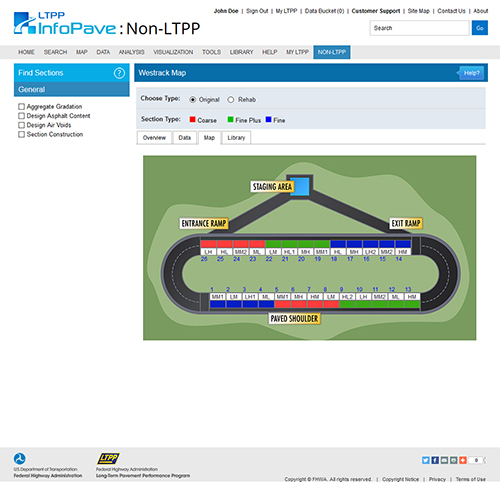 By using the latest methodologies in computer technology, this Web-centric interface is designed to improve access to LTPP data. In addition to providing access to LTPP data, the interface also provides information, education, and tools to maximize the use of available data. 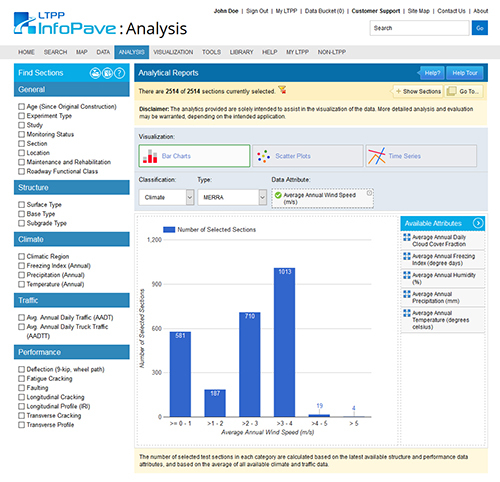 LTPP InfoPave includes creative tools for data viewing, identification, and selection that helps users create their own personalized data sets, summary reports, queries, and much more. It gives users the ability to share data selections, views, or queries with other users, which can exponentially improve LTPP data usage across geographic boundaries and time zones. 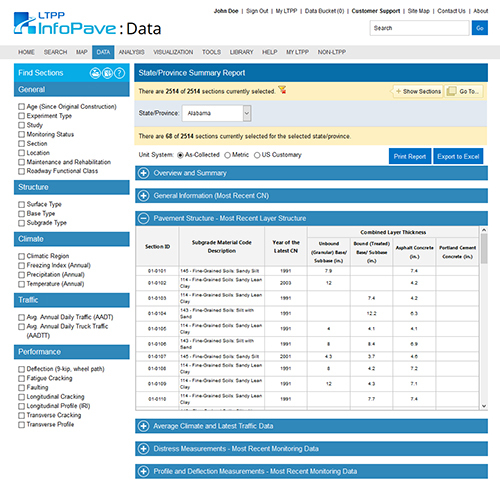 With LTPP InfoPave, LTPP data are at people's fingertips, allowing them to obtain the right data efficiently and extract practical information regarding pavement engineering and management.